Watersound real estate is one of the ‘jewels” among St. Joe’s award winning developments along scenic highway 30A in South Walton County. This exclusive, gated community is situated between protected state preserve and has an entire mile and half of pristine beach on the Gulf of Mexico. Watersound real estate consists of smartly designed, award winning “Cape Cod” style homes and condominiums featuring outstanding architectural design, magnificent views of Camp Creek Lake and the Gulf of Mexico. This quiet, less crowded community boasts one of the very few areas that has huge, rolling sand dunes that are interspersed with private walkways that meander among natural coastal dune lakes all while providing excellent access to the Gulf. Watersound Beach, Florida is an amenity rich community centrally located along Scenic Hwy 30a that offers nature trails for walking or jogging, community swimming pools with entertainment areas, a state of the art fitness center, a dog park and an 18 hole “puttering park”. 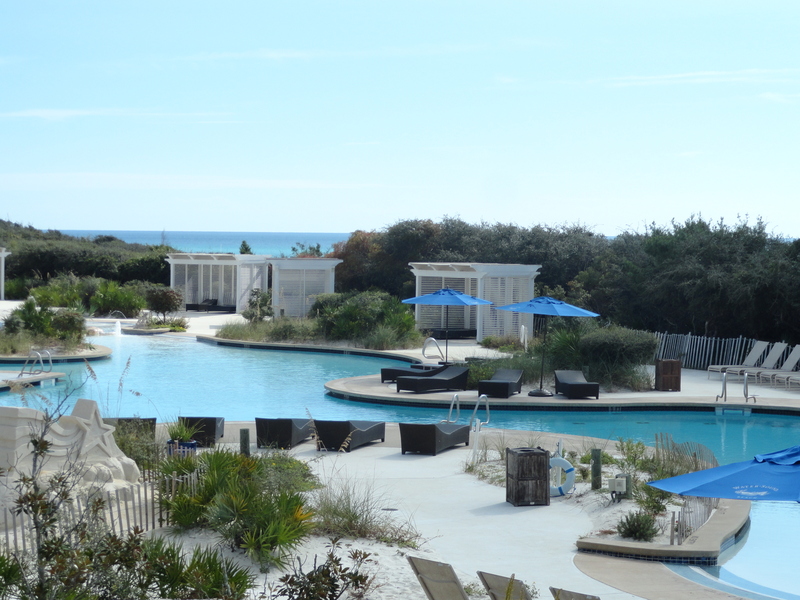 The Watersound Beach Club is exclusive and membership only, offering seclusion and privacy with separate beach access, beach chair service, a spacious swimming pool with immediate access to a full service bar and restaurant. If looking for luxury homes on the 30A coast Watersound is must to see. WaterSound Beach Club is a private beach club offering poolside food service, an upscale restaurant and outdoor bar with amazing Gulf Views. During the Season there are kids activities at the pool including Flick and Float where a large screen is dropped so the kids can float in the pool and watch a movie. If you are not a member of the Beach Club then there are 3 community pools available on property. WaterSound Green Spaces and Parks are spread throughout the community offering manicured lawns for an afternoon game of touch football or a game of croquet. Among some of the green spaces are puttering park that offers 18 holes of putt putt golf and the Yacht Pond that offers motorized remote control boats. There are numerous boardwalks that wind through the dunes and even one that allows golf carts all the way to the beach area. WaterSound Golf Opportunities include a par three pitch and put course called Origins or a world class 18 hole Tom Fazio course called Camp Creek. The Origins course in located in WaterSound North and is a great way to spend an afternoon. Camp Creek Golf Course winds is a very secluded 18 hole golf course surrounded by nature preserve. WaterSound West Beach is a smaller area of WaterSound with a community pool, a deeded beach walkover through the state preserve and 199 homes that are South of 30a, more cottage style and offered in a very affordable price range. WaterSound Beach is considered the Main area of WaterSound that can’t be missed with the very elaborate arched entryway. The homes here are much larger, private custom homes. This area offers some of the main amenities, a community pool and numerous boardwalks all leading to the beach. WaterSound Crossings is a gated oasis for those looking for a quiet lakefront community. There are the crossing condos located gulf front with amazing views and a private pool, large custom homes with amazing lake and gulf views and a community pool. WaterSound Peninsula is an even quieter gated area bordered on both sides by Camp Creek Lake, hence the name “Peninsula”. WaterSound North is the newest edition to the community and is located North of Hwy 98. More to come on this community as the latest details become available.